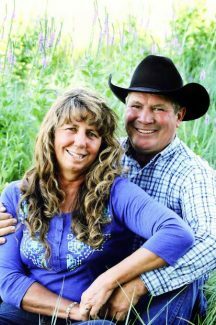 While some ranchers are nervous about what will happen to their operation when they are ready to retire, David and Brenda Reis are not too worried. "All of our kids want to take over the ranch. That would not be sustainable, but the one thing about having a close family, between the kids and us, we'll be able to work out a transition plan," says David, the third-generation to raise cattle in the Missouri River breaks near Reliance. – Shawn, 39; April, 37; Shane, 35; and Zane, 33 ­ remain involved, running cow/calf herds alongside their parents'. They began building their herds as kids with a heifer calf gifted to each of them by their Grandma Reis. After college, the siblings all made the conscious decision to return to the Reliance area to build their lives and families so they could take an active role in the family ranch. Some weekdays and most weekends at least one or all of the children can be found helping David and Brenda on the ranch, ­their families in tow. "Even today we all have fun working together. We make sure that the grandkids are involved too," explains Brenda. 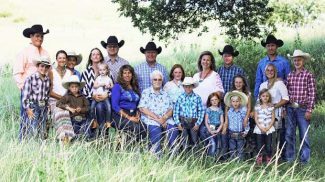 She and David expanded the tradition by giving each grandchild a replacement heifer, which helps encourage future interest in ranching. David and Brenda started out as just a couple of ranch kids. Today the couple takes great joy in ranch work. Since the beginning, the couple made a point to foster an environment on their Lyman County ranch where the entire family could enjoy time working together. "Time with family is the whole idea," explains David, the third generation Reis to raise cattle and kids on the rangeland located near the mouth of the White River. "Before we were even married we talked about the fact that we wanted this to be a family ranching operation where the kids would feel like they fit right in ­ where we all can have fun together." If you ask their four children, the couple, who will celebrate their 40th wedding anniversary this August, succeeded. "My parents are just fun people. Growing up, they used everything as a learning experience. Don't get me wrong, we worked hard ­ but it wasn't just about getting the work done, it was about enjoying the time we had together," explains April, who owns South Dakota Mail Forwarding, a business in Chamberlain. Now married to Danny Elwood with four children of her own, she appreciates the fact that her children Haleigh, 12; Keeleigh, 10; Wiley, 8; and Oakleigh, 5, also have the opportunity to share in the ranching lifestyle and work on the ranch. "Today, we get the most enjoyment out of helping on the ranch because when we are working, all our kids are with us and we get to watch the cousins work together. Mom and Dad always take time to make sure the kids are involved," says Shawn, who is the livestock manager for Christiansen Land & Cattle. Shawn is married to Heidi and has three sons: Buster, 12; Swade, 10; and Rope, 7. Whether it's carrying the nut bucket or bottle feeding a calf, like their parents, even at a young age, the Reis' grandkids are included in ranch work. "You see a lot of families who hardly know the rest of the family. Since we are all right here, our kids are really good friends with their cousins," says Zane, who owns a fencing and pheasant guiding businesses. Zane is married to Angie. The couple has three children: Collin, 15; Jozie, 5; and Sawyer, 3. Although they do raise some of their own hay, it is not enough to sustain the herd through a South Dakota winter so the Reis family has to purchase feed each year. A few years ago Zane purchased adjoining land to increase the family's access to hay. "I'm trying to make room for my kids so they can grow up similar to how I did. Working on a ranch gave me a good work ethic and it seems like we all appreciate what we have because we had to work for it." Established on the rough terrain of the Missouri River Breaks, the land that makes up the Reis Ranch today looks much the same as it did when buffalo, grazed the native prairie grasses. The family has invested in conservation efforts since David's grandpa, Andy Reis, purchased the land in 1934 and expanded to the present location in 1951 after the Corps of Engineers bought out the headquarters along the Missouri River for flood control. "Most of this land is too rough to farm ­ you can't even drive a 4-wheeler on a large percentage of it ­ however, conversely we do have some very tillable native acres. We could have farmed it, but we chose not to because we believe in maintaining the native range and take a lot of pride in the wildlife habitat we¹ve been able to foster," says Shane, the District Conservationist for Lyman County Natural Resources Conservation Service (NRCS). He is married to Tessa. The couple has a two-year-old daughter, Arista. Over the years the family has enhanced their conservation activities on the ranch by reducing tillage on cropland, planting trees for wildlife and cattle, excluding use on some riparian zones, and experimenting with cover crops in their rotation. Using many of these practices has assisted the family in expanding the herd size for the next generation. To increase stocking rates and improve the grassland health, they have also added miles of cross fencing and pipelines. Although rotational grazing makes more work for David and Brenda, it has paid off. During the 2012 drought, the family was able to maintain their herd numbers. "In dad's time it was just big 2,000-plus-acre pastures where you'd turn the cows out in the spring and round them up in the fall. Today, I move them when the grass is ready to be grazed," explains David. After purchasing additional grassland in the mid-1980s, they began renting the home place from his mom, Peggy, in 1989. He and Brenda took over ownership of the ranch gradually in the last decade. A few other things have changed since David's father, Gordon, or "Bus" as everyone called him, passed away in 1980. For one thing, the couple pushed calving back to May 1 and, now that the kids are no longer living on the ranch to help with night calving, the couple learned that if they feed heifers in the evening, they are more likely to calve during daylight hours. "The kids are here when we need them, but not at night," Brenda explains. When it comes to recordkeeping, the Reis' have also been quick to adopt technology. Brenda maintains digital feed and calving records. This comes in handy because although they graze side-by-side, the five cattle herds remain separate on paper. At the end of the year, each family member pays pasture rent and feed costs based on their herd numbers. Although the family is savvy in adopting new and more efficient ways to manage their land and operation, many of techniques the family uses to work cattle mirror those of their ancestors. "We had a talk a few years ago and decided, as a family, that we would limit the use of ATVs and keep working cattle from horseback and stick with other traditional methods, like roping and dragging for branding," Shane explains. "First of all, we believe these methods cause less stress on the animals, can be more efficient in time management, and most importantly they are the very aspects of the work that we enjoy." Shane recalled how just a few weekends ago all three generations of Reis were helping with branding. 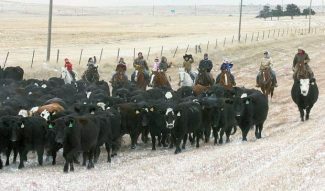 "We enjoy the traditional culture of ranching and the fact that we can all do this together. Even the youngest grandchild, my daughter, Arista, was on a horse. Working and having fun as a family will secure the ranch and our ranching lifestyle for the next generation."